An early Christmas in Brovember! As we would not be spending Christmas all together we decided to do an early christmas when two of J’s brothers came to visit. I wanted to make it as authentic as possible so I asked J what food he would like me to make for our fake Christmas and it was all pretty standard except apparently roast potatoes are not sufficient and we needed to have mashed potatoes as well, which was fine by me as I love mash! 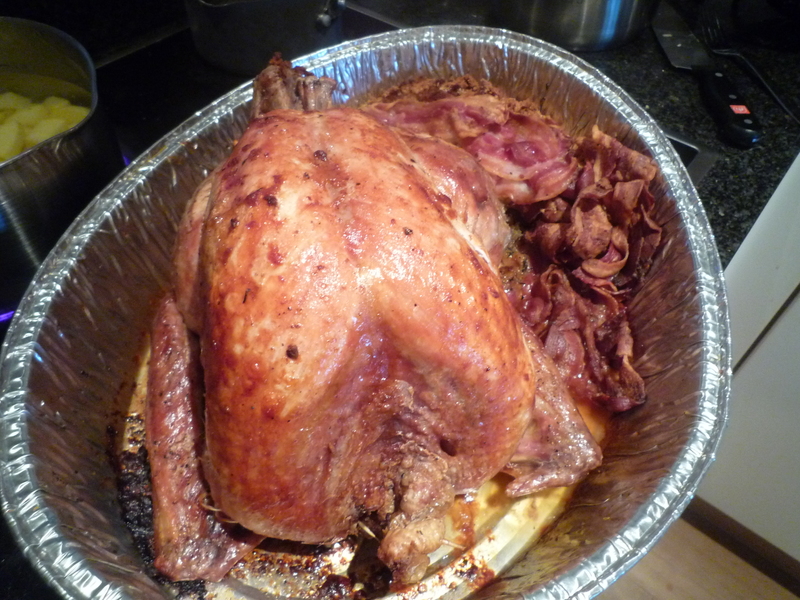 So we ended up with a 3kg roast turkey (bought frozen from Tesco Sandymount and cooked in the way Cooks Academy had suggested, 1/3 of the time on its side, then same amount of time on its other side, then the last 1/3 breast up, basted every 20 minutes), J’s mums tyme stuffing, bacon, roast potatoes, honey roast parsnips (using J’s granddads honey), brussel sprouts, carrots, broccoli, gravy. Of course we had to have a little something to cheers with so we had some champagne as well. For desert, as no one really likes christmas pudding I made a carrot cake with a lemon and cream cheese frosting and banana bread. We also had a selection of Irish cheeses that I got from Fallon & Byrne, we had a cashel blue, an irish goats cheese and a pont l’eveque (obviously not Irish but J’s favourite). J and the boys kindy picked up a delicious baguette for us to have with our cheese from The Butlers Pantry in Sandymount after there kite flying extraveganza at the beach. I even tried my hand at baking a wholemeal loaf for the boys breakfast, which I thought turned out quite well! It was a pretty intense session of cooking having woken up and headed straight into the kitchen and didn’t leave again until the food was served at 2pm. 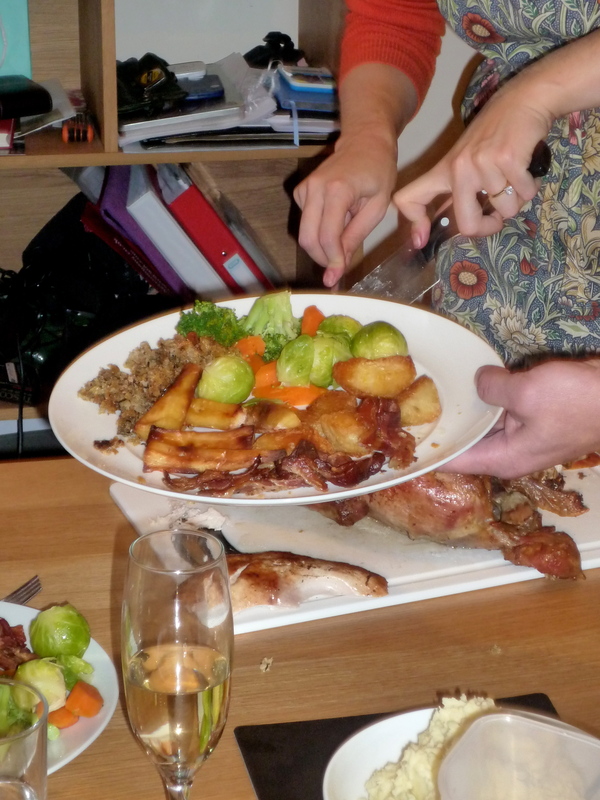 It was first time cooking a full christmas lunch single handed but it went very smoothly and I was very happy with what I served. It was really fun to have J’s family with us in our new home and to enjoy a mock Christmas with them in Dublin. Bread dough in the tin ready for 2nd prove. Carrot cake mix ready to bake! Carrot cake just out the oven. Carrot cake all finished! Looks yummy! Yummy Homemade Carrot Cake with Lemon Cream Cheese frosting. Banana bread just out the oven. Time to fly a kite! Turkey, stuffing covered in bacon and mash on the make! The great unravel after it’s rest! I cannot serve fast enough! Thanks X & N for coming to visit!!! !